The Skinny: Despite stunning images and beautiful set designs, Bae Chang-Ho's take on this cultural icon's story sadly lacks the compelling characters and engaging storytelling to reach beyond the extreme arthouse crowd. In Korea, there was once a profession called kisaeng. Much like the geisha in Japan, the kisaengs are professional female entertainers that are proficient in dance and music, though they are often misunderstood as prostitutes. One of the most famous kisaeng in Korean pop culture is Hwang Jin-Yi, whose story has been immortalized over the years in the forms of novels, dramas, and movies such as director Bae Chang-Ho's 1986 film. Starring veteran actress Jang Mi-Hee, this incarnation focuses very little on Hwang's kisaeng life, instead opting for a tragic story of unrequited love(s). An extremely subtly told story, whose understanding is further hindered by DVD subtitles that stray far from proper grammar (case in point: "My Mother! This fuss occurred due to my fault. "), Hwang Jin-Yi is a work ripe for scholarly study rather than for general consumption. Once nicknamed "the Steven Spielberg of Korea," Bae directed several very commercially successful films in the early 80s, earning him the privilege to take on such a legendary subject. Filmed from a script by novelist Choi In-Ho, Bae's version essentially tells three episodes from Hwang's life. First, she is shown as a member of a noble family. Soon to be married, she encounters a shoemaker who harbors a secret crush on her. When his infatuation is exposed, Hwang is forced to humiliate him in public in order to save his life. 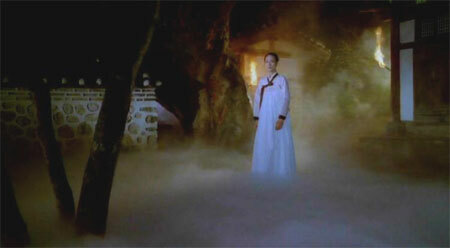 However, the shoemaker commits suicide out of shame, and Hwang leaves home racked with guilt. Skip forward several years, and Hwang has become a popular kisaeng (though labeled as "barmaid" in the subtitles) in Sangdo, though she sells her body to no one. But soon, a nobleman arrives and successfully seduces Hwang. He promises to return to her in the winter, but she is once again left heartbroken. Moving on yet again, she meets an exiled government official after troubling clients forced her from her job. With nowhere to go, Hwang decides to follow the man on his journey. But the man's heart is with his wife and child, and Hwang may yet again be headed for heartbreak. Like Hur Jin-Ho and Hang Sang-Soo, Bae directs with an extremely methodical approach, and he brings that same touch to Hwang Jin-Yi. Composed of long takes and slow movements, the film is not one for the impatient. Many of the crucial plot points are merely suggested rather than shown, requiring the audience to connect the dots on their own. In theory, it's always good to see a filmmaker rely on visual storytelling rather than on verbal exposition. However, Bae's reliance on the "less is more" approach fails to fully engage, as the film often meanders by dragging out each scene to almost unbearable lengths, meaning that most audiences just won't have the patience to wait for something to happen. To compensate for the lack of storytelling, Bae fills Hwang Jin-Yi with stunningly beautiful images. From the morning fog floating on the ground to the final shot on the beach during sunrise, Hwang Jin-Yi is beautifully shot by cinematographer Jeon Il-Seong. The art direction by Nowhere to Hide and Duelist director Lee Myong-Su also captures the period in great detail, foreshadowing Lee's future reputation as a director who sometimes pay a little too much attention to visuals. In fact, sitting through Hwang Jin-Yi is like staring at paintings for hours, and will likely engage only those with such skills. In the title role, Jang Mi-Hee literally carries the entire film on her shoulders. Despite Bae's low-key and somber storytelling, Jang manages to shine through, creating a true tragic character rather than simply going through the motions. Choi's script in this sense becomes both Jang's advantage and downfall. With dialogue stripped down to the bare minimum to reveal plot points, Jang is challenged to truly act by relying purely facial expressions to show emotions and inner thoughts. On the other hand, a bare script also means Jang has to work with a character lacking sufficient development; the audience is supposed to identify with Hwang because she's the main focus, but no one really knows why she deserves such focus.